Today the St. Louis Preservation Board will consider recommending approval of the National Register of Historic Places nomination for the O’Fallon Park Historic District. This meeting is the first step toward listing the historic neighborhood in the National Register. After today, the nomination heads to the biggest step: consideration by the Missouri Advisory Council of Historic Preservation at its next public meeting on August 17. If the Advisory Council approves the nomination, it will be sent to the National Park Service for final listing. Depending on the length of that consideration, the O’Fallon Park Historic District might be listed in the National Register of Historic Places by the end of October. State and federal historic rehabilitation tax credits would be available immediately. 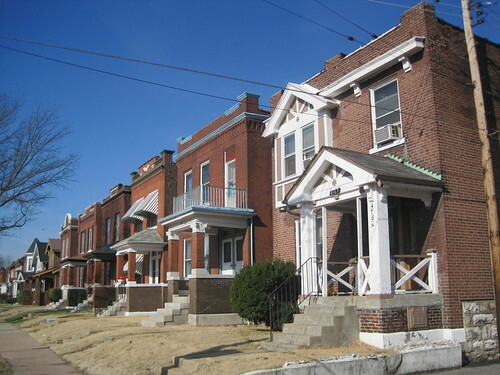 The 4500 block of Alice Avenue within the nominated district. 4563 Alice Avenue (1910) is at right. Last year, after Alderman Antonio French (D-21st) funded the project through the Acts Partnership, the Preservation Research Office started the building-by-building architectural survey of some 1,596 primary buildings and over 500 secondary resources (mostly garages). The survey encompassed the entire neighborhood. Due to demolition in the center of the neighborhood between Lee and Penrose avenues, Preservation Research Office and Alderman French agreed to nominate the neighborhood through two historic district nominations. The second nomination will be submitted to the State Historic Preservation Office soon. This stone-faced house at 4236 West Florissant Avenue (c. 1894) has Romanesque porch details and faces O'Fallon Park. A flyer on the district project circulating in the O’Fallon neighborhood can be downloaded here. Residents of the nominated area with questions or comments can leave them here or contact us at 314-920-5680. 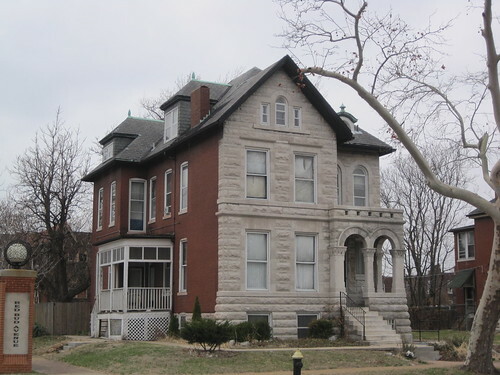 This entry was posted in National Register, North St. Louis, O'Fallon, Uncategorized. Bookmark the permalink. Looks like a good start to a future sustainable neighborhood. Any link to the public history of the historic district?